Benson High School Principal Curtis Wilson Jr. (top, center) is joined by his wife Yushonna, and son Andrew, as he receives a Lifetime Achievement Award at The World Arts Foundation’s annual Tribute to Dr. Martin Luther King Jr. held last Monday at the Highland Center on Northeast Glisan Street. Portland Observer Publisher Mark Washington (bottom, second from right) enjoys the festivities of the 34th annual Martin Luther King Jr. Tribute with his children and grandchildren, where he received a Lifetime Achievement Award. 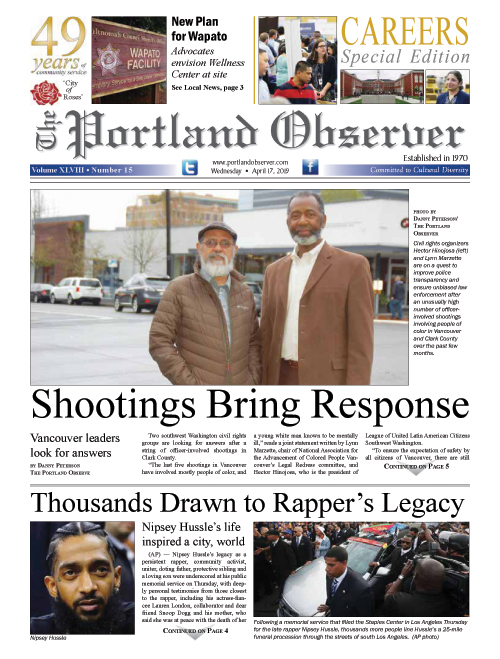 Two longtime members of the African American community, Portland Observer Publisher Mark Washington and Benson High School Principal Curtis Wilson Jr., were among the over a dozen individuals and organizations to receive Lifetime Achievement Awards at the 34th consecutive Tribute to Rev. Dr. Martin Luther King Jr.